Description: “The Overseer’s cabin at West Pit bottom, main coal level”. Manvers Main Colliery, Wath in South Yorkshire. There is evidence of coal mining in Yorkshire dating from the Roman era. However, it was in the 19th Century, with the onset of the industrial revolution that coal mining became a major industry. In many villages and towns, the coal mine became the chief source of labour and income. After the First World War, the coal mining industry began a long period of decline as increasing competition from abroad made many Yorkshire pits uncompetitive. 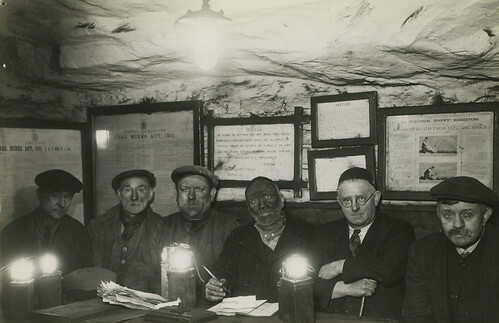 In 1946, the coal mines were nationalised, partly due to the ideology of the incoming Labour government, but also because the private coal mines were struggling to stay afloat. 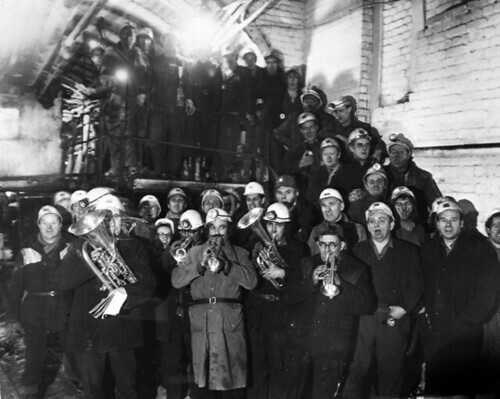 In the post war period, miners experienced a relative decline in pay, leading to prolonged and bitter pay struggles, with miners going on strike. In the 1970s, strikes were often effective in gaining increased wages. But, the great Miners strike of 1984, ultimately failed, despite a year long bitter dispute. After 1984, the coal mining industry shrank leaving only a couple of mines left producing coal. Christmas underground in a coal mine. * Huskar Pit Disaster: The pit flooded during a rainstorm in 1838 and 26 children were drowned. This disaster led to the 1842 commission on the employment of children and women in mines which resulted in the banning of female and child labour underground. * Warren Vale Colliery: A firedamp explosion caused by naked flame in 1851 resulted in the death of 52 miners. At the inquest the coroner insisted on there being an increase in the number of mines inspectors in the district. * Lower Elsecar Colliery: A firedamp explosion in 1852 resulted in the death of 12 miners. In response to this explosion, Benjamin Biram the collieries mining engineer fitted the first underground fan to improve ventilation. * The Oaks explosion: A series of firedamp and coal dust explosions that resulted in the death of 361 men and boys. This was the worst colliery disaster in the United Kingdom until the Senghenydd Colliery Disaster disaster in 1913 and is to date the worst in England.